Viber, a mobile application that offers users free phone calls and text messaging to other Viber users over 3G and Wi-Fi, announced the official launch of the Android version of the app, bringing Viber to millions of additional users. Viber also announced that it has acquired over 12 million active users (last 30 days) and has an impressive call traffic volume of over one billion minutes of calls per quarter. Viber was released for iPhone just seven months ago and it now has over 20 million registered users and 12 million active users who currently talk on Viber for 11 million minutes every day, with an average of 6 minutes per call. 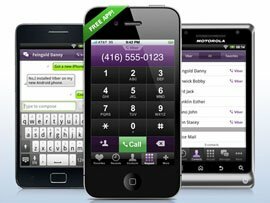 A default dialer setting that enables users to use the Viber dialer for all their phone calls, not just for Viber calls. "We have been looking forward to launching our Android app, especially after having received a staggering number of requests from Android users asking us to bring Viber to the Android market. Our latest user numbers are the best indicator of how much our users love to talk and send messages for free with Viber," said Talmon Marco, Viber CEO.